The INTEGRA group, comprising INTEGRA Biosciences AG and the Viaflo Corporation, maintains a worldwide network of over 90 independent, highly trained, distribution partners. INTEGRA Biosciences AG is headquartered in Zizers, Switzerland, Viaflo Corporation is located in Hudson, NH, USA. INTEGRA is making multichannel pipetting quicker and easier than ever before. INTEGRA has published a new video that demonstrates how US-based biotech contract research specialists Likarda LLC are using their VIAFLO ASSIST to cost effectively develop high throughput cell based assays for their customers. INTEGRA announces how its VIAFLO 96 multichannel electronic pipette has been adopted by Neoteryx LLC as an integral part of a new high throughput biological sample collection and processing system. Unlike traditional reagent reservoirs, INTEGRA offers a range of high quality multichannel reservoirs that feature reusable bases. INTEGRA has launched a new responsive website which ensures visitors automatically enjoy a perfectly formatted surfing experience be it viewed from a desktop, tablet or mobile. Liquid handling specialists, INTEGRA have produced a new poster that provides informative guidelines to enable any lab that has access to a microbalance, to perform a quick routine check that offers many of the benefits of an annual pipette calibration. 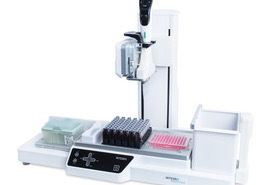 INTEGRA announces that their VIAFLO ASSIST personal pipetting assistant has been optimized for use with Linkage Biosciences LinkSēq™ tissue typing products. INTEGRA has introduced a new plate holder enabling 1536-well pipetting on its VIAFLO 384 electronic handheld pipette. INTEGRA announces the launch of eight and twelve channel versions of its innovative EVOLVE manual pipette. INTEGRA announces the launch of a single channel version of its innovative EVOLVE manual pipette. Unlike traditional pipettes which utilize a single rotating plunger to set volumes, the EVOLVE features three adjustable dials for setting each individual volume digit. Simply depress and twist the plunger to unlock the volume dials. Once unlocked, freely adjust the three dials to rapidly set the desired volume. This revolutionary approach allows users to set volumes more than ten times faster. Covering a volume range of..
INTEGRA has expanded the range of interchangeable pipetting heads for its market-leading handheld VIAFLO 96/384 electronic pipettes. Unlike traditional pipettes which utilize a single rotating plunger to set volumes, the new EVOLVE manual pipette range from INTEGRA features a revolutionary approach that allows users to set volumes more than ten times faster. INTEGRA announces the launch of the EVOLVE manual pipette range. The VIAFLO 96/384 from INTEGRA is a handheld electronic pipette that enables fast, precise and easy transfer of 96 or 384 samples simultaneously. INTEGRA announces the latest version of its VIAFILL reagent dispenser. INTEGRA, in conjunction with DPX Labs LLC, has produced an application note that describes a novel high throughput semi-automated sample method for processing urine samples ready for drugs of abuse analysis by LC-MS/MS. VACUSIP is a portable benchtop vacuum aspiration system from INTEGRA that you can place wherever you need it. INTEGRA reports on how researchers at the Health Innovation Research Institute at RMIT University (Bundoora, Australia) are using VIAFLO II electronic pipettes in conjunction with a VIAFLO ASSIST to scale-up their screening of venoms and small compounds. Drawing upon decades of vacuum aspiration experience - INTEGRA has compiled an unbiased series of hints and tips to help you improve your safe and efficient disposal of biological waste. In this new highly informative illustrated 'Best Practices' guide, expert advice is provided in areas including getting to know about safety and environmental requirements, waste segregation, safe liquid transfer, waste containment, correct labelling and disposal. Each area of best liquid waste disposal practice discussed is backed up with an explanation of why this produces optimal results. INTEGRA reports on a new technical note produced by Analytik Jena that compares the performance of the INTEGRA VOYAGER adjustable tip spacing multichannel pipette with a manual single channel pipette for performing real-time PCR experiments. INTEGRA has created an informative ‘How-It-Works’ data sheet and a short, simple and engaging ‘SimpleShow’ format video to explain the operation and safety features of their FIREBOY Safety Bunsen Burner. A new short and engaging SimpleShow’ format video from INTEGRA introduces and explains the unique features and benefits of their Multichannel Pipette Reagent Reservoirs. INTEGRA reports on how researchers at the renowned Forsyth Institute (Cambridge, MA) are using a VIAFLO Assist to enhance the efficiency while maintaining the accuracy of pipetting protocols related to the discovery, measurement, and validation of new biomarkers of disease that can be found in saliva. Following the launch of its limited edition PIPETGIRL pink pipette controller in support of breast cancer research earlier this year - INTEGRA is pleased to announce it has made a $10,000 contribution to the Susan F Smith Center for Womens Cancers at the Dana-Farber Cancer Institute in Boston (MA, USA). For the vast number of scientists that undertake handheld pipetting protocols - INTEGRA has produced a highly informative illustrated 'Best Practices' guide. Drawing upon decades of pipetting experience - INTEGRA has compiled an unbiased series of hints and tips to help you improve your handheld pipetting. Expert advice is provided in areas including before you start, how to pipette and optimising pipetting performance. Each area of best pipetting practice discussed is backed up with an explanation of why this produces optimal results. The Institut Curie (Paris, France), a world leader in oncology research, has reported how it has standardised on using MEDIACLAVE media preparation and MEDIAJET automated petri dish filling systems from INTEGRA Biosciences to prepare its petri dishes. The virus and prion validation group at Octapharma GmbH (Frankfurt, Germany) reports how implementing an INTEGRA VIAFLO 96 has enabled them to reduce the time taken to undertake PCR assays by greater than 60%. INTEGRA has published a new customer video from the Institute of Clinical Chemistry research group at the Technical University of Munich (TUM), in which researcher Christina Thomas reviews how the VOYAGER multichannel pipette has accelerated their sample screening and genotyping assays. Following on from the successful launch of subsidiaries in France, the UK and the USA - INTEGRA Biosciences has announced the opening in January 2015 of a new organisation based in Konstanz, Germany. Handheld pipetting requires considerable experience and expertise to achieve reproducible results in applications such as serial dilution. Serial dilutions can be difficult to perform reproducibly due to the many mixing steps that are required. 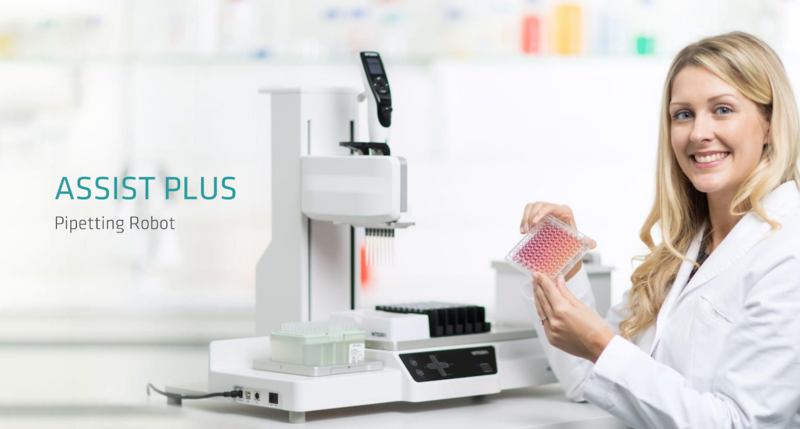 The INTEGRA VIAFLO ASSIST enables scientists of all pipetting skill levels to achieve better serial dilution results. To use the VIAFLO ASSIST, simply mount a VIAFLO II electronic pipette onto the pipette adapter, define the number of mixing cycles, speed and mix volume, and press the run button. VIAFLO ASSIST will then obtain the protocol via Bluetooth from the VIAFLO II electronic pipette and automatically execute it. INTEGRA has created a short, simple and engaging ‘SimpleShow’ format video to explain the safety features of their FIREBOY Safety Bunsen Burner. INTEGRA Biosciences has launched PIPETGIRL - a new pink version of its popular PIPETBOY acu 2 pipette controller. The VIAFLO ASSIST from INTEGRA reduces the need for traditional handheld pipetting to a minimum, relieving lab personnel from activities that may cause repetitive stress injuries. 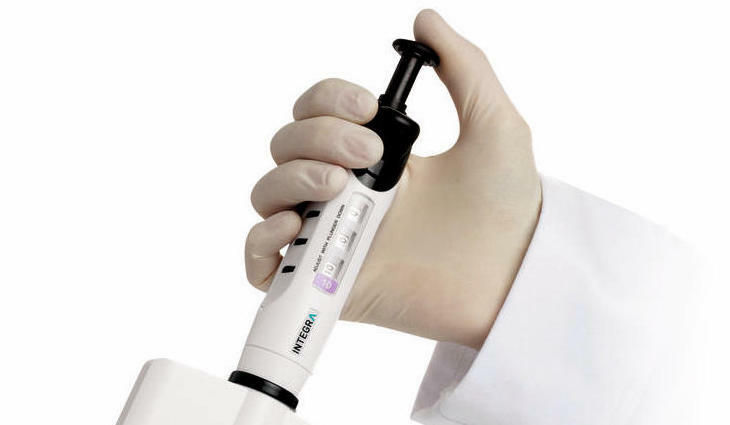 INTEGRA has introduced a Three Position Stage for its VIAFLO 96 and VIAFLO 384 handheld benchtop pipettes. At SLAS 2015 - product specialists from INTEGRA will be on hand to demonstrate and answer questions on the company's popular range of productivity enhancing liquid handling products. INTEGRA offer an efficient way to increase sample throughput without the expense of a robotic system. INTEGRA has introduced a Row Dilution Plate Holder accessory for its VIAFLO 96 and 384 handheld benchtop pipettes. The new row dilution plate holder adds the functionality to perform serial dilutions in rows. Serial dilutions are often carried out in row format because it allows experimenters to dilute more samples (12 instead of 8 in a 96-well plate). The plate holder can easily be adapted to work with either 96 or 384 well plates. INTEGRA has announced a software update for its VIAFLO II electronic pipette range that now features a full-text, multilingual user interface in English, German, French, Spanish, Japanese and Chinese. INTEGRA has published a new video testimonial* in which researchers at the Institute for Clinical Chemistry at the Technical University of Munich (TUM) describe the benefits of using the VACUSAFE Laboratory Aspiration System to provide simple, reliable and safe aspiration of cell culture supernatents. The Institute of Genetics and Development of Rennes (IGDR), France reports on how, using a VIAFLO 96 handheld multichannel pipette from INTEGRA, they have been able to improve the efficiency and speed with which they replicate yeast strain collections and perform genetic screens in 96 well plates. INTEGRA Biosciences has received a Red Dot Design Award for its innovative VIAFLO ASSIST - a new laboratory device that, in combination with a VIAFLO II electronic handheld pipette, enables the pipette’s protocols to be performed automatically. With its origins dating back to 1955, the Red Dot Design Award ranks among the most renowned design competitions in the world. INTEGRA received the prestigious Red Dot Design Award for the innovative design and function of its VIAFLO ASSIST pipetting assistant that reduces the need for traditional handheld pipetting to a minimum, relieving lab personnel from activities that may cause repetitive stress injuries. The new VIAFLO II multichannel electronic pipette range from INTEGRA combines ultra lightweight design and unsurpassed operation comfort enabling users to improve efficiency in their working environment. INTEGRA announces the VIAFLO ASSIST - an innovative new device that, in combination with a VIAFLO II electronic handheld pipette, enables the pipette’s protocols to be performed automatically. A new customer testimonial video from INTEGRA demonstrates how the VIAFLO VOYAGER motorised adjustable spacing pipette can be used to rapidly set up a 384-well qRT-PCR plate for analysis in a ViiA™ 7 Real-Time PCR system (Life Technologies). Building upon over 30 years of unmatched quality and hundreds of thousands of instruments in use worldwide - INTEGRA announces the launch of the new PIPETBOY acu 2 serological pipettor. INTEGRA has launched new single-use waste collection bottles for its VACUSIP benchtop aspiration system – a compact, portable solution for safe and convenient disposal of small volumes of biological liquid waste. INTEGRA has published a video* demonstrating how its VIAFLO 96 handheld electronic pipette, used in conjunction with the Seahorse Bioscience XF96 Extracellular Flux Analyzer, provides high throughput screening of the cellular bioenergetics of multiple cell lines. INTEGRA Biosciences has announced, as of August 1st 2013, a direct sales / support team in the UK to further improve support of its local customer base. PIPETBOY pro from INTEGRA sets the benchmark for fast, accurate pipette filling and dispensing. INTEGRA has released a new video demonstrating a solid phase extraction (SPE) microplate method for reproducible, high throughput isolation of high-quality DNA-free total RNA. Portable System for Aspiration and Disposal of Biological Waste Aug 21, 2012 The VACUSIP from INTEGRA provides an ideal benchtop solution for the safe aspiration and disposal of small volumes of liquid waste in clinical, molecular biology, biochemistry and microbiology labs. Application Capabilities & Benefits of Using Electronic Pipettes Jun 29, 2012 INTEGRA has created a new web page giving lab scientists instant access to a wealth of information relating to the applications capabilities and benefits of using electronic pipettes. Low Dead Volume Reservoir Saves on Reagent Costs Jun 26, 2012 INTEGRA has introduced a new 10mL disposable multichannel reagent reservoir whose low dead volume (650µL) generates significant savings on reagent usage. Video Demonstrates Award Winning Handheld 96-Channel Electronic Pipette Jun 14, 2012 An informative new video demonstrates many of the features and benefits of the INTEGRA VIAFLO 96 that have enabled labs around the world to accelerate their workflows. Innovative products for healthcare labs Dec 9, 2010 INTEGRA has announced that it will be displaying a broad range of its latest liquid handling and media preparation products at Arab Health 2011 - one of the world's largest healthcare tradeshows and congresses. Efficient & Reliable Automated Filling of 2-Compartment Petri Dishes Nov 26, 2010 Using a MEDIAJET vario Automatic Media Preparation System from INTEGRA - leading Danish healthcare provider - Herlev Hospital has drastically increased the efficiency and reliability of preparing its 2-compartment agar plates. Precision Multichannel Pipetting Enables Fast & Economic 3D Microtissue Cultivation Sep 2, 2010 INTEGRA, in association with Insphero (Zurich, Switzerland), have released an application note** that describes how a precise pipetting technology enables the efficient use of a hanging drop culture system overcoming many of the drawbacks of conventional cell culture techniques. Reliable Walk-Away Media Preparation & Processing Jul 19, 2010 An informative new video from INTEGRA describes the operation and applications of its industry leading MEDIACLAVE Media Preparation and MEDIAJET Automated Petri Dish Filling systems. Eco Friendly Packaged Pipette Tips... Jun 16, 2010 INTEGRA Viaflo has introduced GREEN PACKTM - an environmentally friendly version of its GripTipsTM pipette tips for use with its range of electronic pipettes. Pipette Tips That Ensure Perfect Pipette Connection May 18, 2010 Developed by INTEGRA VIAFLO - GripTipsTM are a next generation range of pipette tips that ensure the perfect connection between pipette and tip. Guide To Ergonomic Pipette Use & Handling May 10, 2010 INTEGRA has announced the availability of an informative guide that discusses ergonomic pipette design and provides useful tips regarding proper use and handling of these popular laboratory tools. Video Demonstrates Safety-certified Bunsen Burner Mar 30, 2010 INTEGRA have released a new online video that demonstrates why the FIREBOY is the Safety Bunsen Burner of choice for laboratories seeking high application safety, user operating comfort and unmatched operational versatility. INTEGRA Announces Major Program of Introductions for Analytica 2010 Feb 17, 2010 INTEGRA has announced a major program of introductions for the forthcoming Analytica 2010 trade fair in Munich, Germany (23rd - 26th March 2010). Comfortable Error-Free Pipetting Feb 10, 2010 The new INTEGRA PIPETBOY pro pipetting aid unites all essential characteristics for productive work with serological pipettes: accuracy, speed and comfort. Electronic Pipettor Offers Affordable and Flexible Sample Handling Jan 28, 2010 Available with six, eight or twelve channels the new VoyagerTM electronic pipettors from INTEGRA feature a revolutionary mechanism that alters tip spacing at the press of a button. Liquid Handling Company Launches New Corporate Brand Jan 15, 2010 Following its recent merger with the Viaflo Corporation - INTEGRA Biosciences AG has announced that from 1st January 2010 the companies will adopt the new corporate brand - INTEGRA. Versatile Handheld Vacuum Tweezers Dec 9, 2009 INTEGRA Biosciences has announced PIPETBOY vacuum tweezers, a handheld suction device for manipulating small or delicate items that cannot be touched. Versatile Aspiration System for Safe Vacuum Disposal of Liquids Dec 8, 2009 INTEGRA Biosciences has extended its VACUSAFE aspiration system with new models for laboratories wishing to utilise an existing supply of vacuum while benefiting from many of the advantages of the internationally popular product. The new design, without integrated vacuum pump, has been priced to be affordable by almost all laboratories. INTEGRA to Showcase New Products at ArabLab 2010 Dec 8, 2009 Integra Biosciences has chosen ArabLab 2010 to showcase its latest products for biotechnology, pharmaceutical and clinical laboratories. Petri Dish Filler Offers Automated Filling of Biplates & Pour Plate Functionality. Sep 28, 2009 INTEGRA Biosciences, a leading manufacturer of reliable and productive instruments for media processing, has announced several new features and a product range extension expanding the versatility and further improving the reliability of its popular MEDIAJET automated Petri dish filler.